The Sectorial Armies are specific sections of the army, or small territorial armies from a specific area, region, or planet of the faction to which they belong. Most of the factions in Infinity has, at least, one Sectorial Army. The Sectorial Armies have their own distinct Army Lists with troop Availabilities different from the generic Army of the faction they belong to. They will often have greater access to specific units at the cost of not being able to access others units from their generic Armies, which in turn belong to other Sectorial Armies of the same faction. A player who uses a Sectorial Army List will only be able to field troops indicated in the Sectorial Army, and will not be able to field troops from the Generic Army List not also specifically listed in the Sectorial Army. At the same time, if a Generic Army List is used, players may not field Sectorial Army troops not included in the Generic Army List, or field the troopers using the Availabilities of the Sectorial Army. The Sectorial Army Lists are completely official and tournament valid; they can be used in the ITS (Infinity Tournament System). 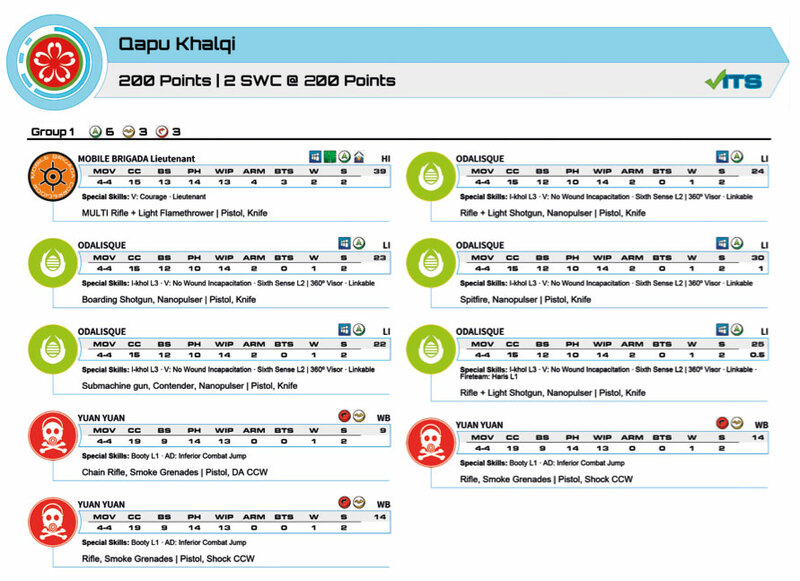 In the Haqqislamite Sectorial Army of Qapu Khalqi, players may field up to five Odalisques, as well as one Mobile Brigada from the Nomad Nation and up to three Yuan-Yuan Mercenaries. Players cannot however field any Hassassin troopers or a Murabids Tuareg. 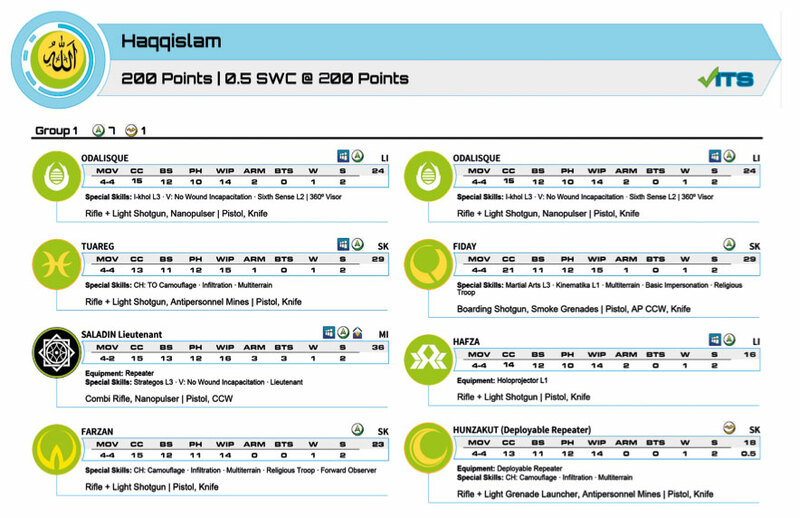 At the same time, in the Generic Haqqislamite Army players are limited to the Generic Availability of the Odalisques (which is two), but will have access to all Haqqislamite Army List troops, and will not be able to field troopers from any faction other than Haqqislam. 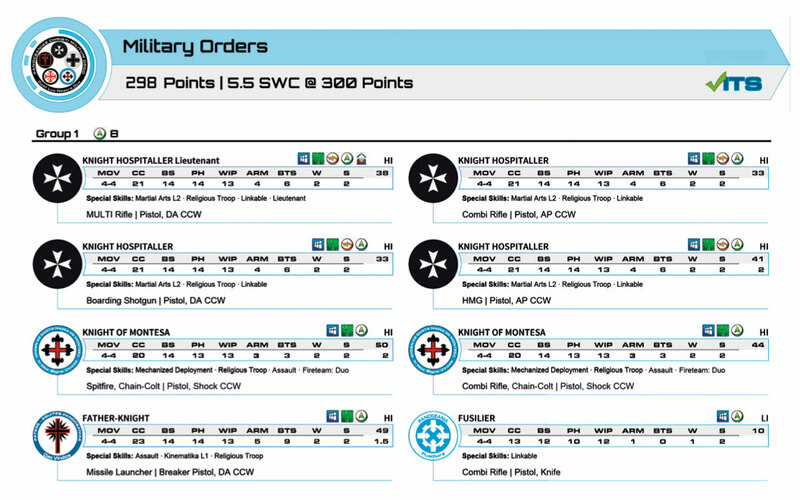 The Military Orders Sectorial Armies are thematic, centered on a specific Military Order chosen by the player. The entry "Order Knights" with AVA 4 means that players may field up to four Knights belonging to the same order (for example, four Hospitallers). On the other hand, the "Confrère Knights" are those belonging to other Military Orders that cooperate with the one the player has chosen. The entry "Confrère Knights" with AVA 2 indicates that up to two knights belonging to any other Order (for example, a Montesa and a Teuton in an Army of the Hospitaller Order, or two Knights of Santiago). This page was last modified on 28 September 2018, at 21:40.